Since the 18th Century, Western Classical music has depended on the notion that its creators are geniuses: composers gifted with knowledge, insight, and ability not attainable by the average person. This has elevated their work to a near sacred status, imbuing their music with added meaning and relevance. The myth of the composer-genius devalues the skill of the composer. The myth of genius paints composition as only a gift given to a chosen few. The myth of genius has been used to alienate the listener. The myth of genius is a tool to preserve the Classical canon, and has turned the concert hall into a museum. The myth of genius is used to keep music dead, white, and male. This post is Part II in a two-part series. Points 1. and 2. were covered in Part I while points 3-5 will be covered in here. Be sure to read Part I before reading on. We are fascinated by genius. We marvel at brilliant minds. Truth be told, it is a point of pride that society venerates figures like Albert Einstein, Leonardo Da Vinci, or Benjamin Franklin. It says a lot about us that we flock to thinkers like Carl Sagan, Bill Nye, or Neil DeGrasse Tyson. We not only respect genius, we worship it. This fact was not lost on the composers of the 18th and 19th Centuries, or their promoters and patrons. In many ways, Classical music survives today because we still want to bear witness to that genius. However, genius can also cause alienation. Not everyone wants to sit through a lecture that they do not understand. Neither is everyone interested in sitting in a stuffy concert hall for hours simply because some long-dead geniuses wrote the music that is being played. Often two solutions are given to this problem: either the listener must be educated in order to appreciate the genius of the music, or the ignorant listener is simply dismissed. It should be no surprise to us then, that our audiences remain homogenous in age, race, and socio-economic background. For I am concerned with stating an attitude towards the indisputable facts of the status and condition of the composer of what we will, for the moment, designate as "serious," "advanced," contemporary music. This composer expends an enormous amount of time and energy — and, usually, considerable money — on the creation of a commodity which has little, no, or negative commodity value. He is, in essence, a "vanity" composer. The general public is largely unaware of and uninterested in his music. The majority of performers shun it and resent it. Consequently, the music is little performed, and then primarily at poorly attended concerts before an audience consisting in the main of fellow 'professionals'. At best, the music would appear to be for, of, and by specialists. Towards this condition of musical and societal "isolation," a variety of attitudes has been expressed, usually with the purpose of assigning blame, often to the music itself, occasionally to critics or performers, and very occasionally to the public. But to assign blame is to imply that this isolation is unnecessary and undesirable. Why should the layman be other than bored and puzzled by what he is unable to understand, music or anything else? It is only the translation of this boredom and puzzlement into resentment and denunciation that seems to me indefensible. After all, the public does have its own music, its ubiquitous music: music to eat by, to read by, to dance by, and to be impressed by. Why refuse to recognize the possibility that contemporary music has reached a stage long since attained by other forms of activity? The time has passed when the normally well-educated man without special preparation could understand the most advanced work in, for example, mathematics, philosophy, and physics. Advanced music, to the extent that it reflects the knowledge and originality of the informed composer, scarcely can be expected to appear more intelligible than these arts and sciences to the person whose musical education usually has been even less extensive than his background in other fields. But to this, a double standard is invoked, with the words “music is music," implying also that "music is just music." Why not, then, equate the activities of the radio repairman with those of the theoretical physicist, on the basis of the dictum that "physics is physics." There was no need for Babbitt to even mention the word “genius.” His call for the embrace of isolation on the part of the “specialist,” and comparison of their work to that of a physicist, displays his thinking that concert music was no longer an artform to be enjoyed by the masses, but a scientific study. The patronage of the past was disappearing, and the public was not interested in supporting the creation of Modernist music, however, the academy was. Babbitt, who was instrumental in creating the first Ph.D program in composition at Princeton University — and who also studied and taught mathematics — saw his work as not only creation, but research. It is interesting to hear his argument for music as an almost scientific study, when unlike physics or biology, systems of music have little to do with natural phenomena. These systems — tonality and serialism — were not discovered, they were made up. Study of these systems do not yield deeper truths into nature or physics. Research and experimentation in music does not occur in a lab, they occur in the mind of the composer. Yet the academy became a natural safe space for this experimentation. Thus, began the continual quest to justify its existence with pseudo-scientific research and scholarship (but that is perhaps a rant for another day). Of course, none of this is to criticize Modernism. Composers like Babbitt helped create new forms of expression, while also producing powerful and evocative music. Yet, that doesn’t make his words any less problematic. Babbitt famously opposed the title “Who Cares If You Listen,” given to the essay by an editor against his will, but that does not make his beliefs any less dangerous for the longevity of our artform. A self-satisfying artform created by specialists for the consumption of specialists alone is not sustainable. Why should the public, government, or university support an endeavor that is not meant to serve or be appreciated by anyone else but those who created it? A purely scientific approach to music is also foolhardy. An expressive and subjective artform turned into an objective study is no longer art. While every listener will not be interested in Babbitt’s music, a wiser choice might have been to explain to the layman how his music is constructed, and why he chose to use the serial system instead of tonality. He could have explained that tonality only has the ability to express a portion of human emotions and psyche. He could have explained that even if the layman didn’t “understand” the music, perhaps there was still something in it for them to admire. After all, does the layman actually “understand” a Classical symphony or a work of modern art? Yet there is still something to be appreciated by exploring art that one does not understand. Instead, in 1958, Babbitt wasn’t concerned about reaching out to the layman. After all, if you’re a genius, why bother with the opinions of those beneath you? While genius can be off-putting and alienating, genius can also command our fascination and admiration. We flock to hear great minds speak and impart some of their knowledge on us. The concert hall is where we flock to hear the voices of the great composers of the past. The act of creation is both mystifying and worshipped. We often feel like a part of the composer’s soul was left in a work, and hearing that music can reveal it. Going to a live performance is the closest we can come to communing with these long-dead geniuses. The concert hall is a temple, or perhaps a museum. It has been millions of years since dinosaurs walked the planet. Thousands of years since the pharaohs of Egypt ruled. Hundreds of years since great artists like Da Vinci or Michelangelo created their legendary works of art. But in the museum, we can stand in the shadow of their remains, and somehow feel a little bit closer to them. This is what the concert hall has become over the centuries. It is sadly not out of the ordinary to see orchestral and chamber music seasons consisting solely of the music of the Common Practice. Each orchestra has to put their yearly “bold” stamp on the Beethoven, Brahms, or Mahler symphonic cycles. Occasionally a short new work will be sprinkled in here and there. Perhaps if we are lucky, we may get a full festival or series devoted to new works. Otherwise, Rite of Spring is the most radical that the orchestras of the United States and muster. The concert hall is not a venue to see a living, breathing, and relevant artform in action. It is a museum to quietly appreciate the fossils of our artistic past. We (myself, very much included) go to hear music that we’ve heard dozens of time in concert, and hundreds of times in recordings, just to see how this conductor and orchestra do it differently from all the other conductors and orchestras in the world. In no other artform do you see such a strong grip to the works of the past. In most other artforms, new works are not merely tolerated, they are expected and celebrated. Art galleries across the country, from those in small towns to the most celebrated institutions of major cities, devote whole wings or even the whole building to new works. While aging patrons angrily storm out of modern music concerts, modern paintings sell for millions of dollars. While repertory theatres present the classics, new plays and musicals are constantly produced and celebrated. We do not go to movie theaters to watch the same classic films every year. Publishers do not merely keep reprinting and selling the same novels or poetry anthologies, they seek out the best and brightest new writers and extol their work. So why is concert music stuck in the 18th and 19th Centuries? Not only that, but why are American orchestras stuck in 18th and 19th Century Europe? A survey by the Baltimore Symphony of the 2014-15 seasons of twenty-one major orchestras showed that only 10.6% of works performed were by Americans. 37.8% were by German or Austrian composers, and 19.2% were by Russians. Only 11.4% of the repertoire were by living composers, and a measly 1.8% were by female composers. No data was offered on ethnicity. In our service to dead European geniuses, we have neglected our own music. Some argue that modern music simply doesn’t sell. If orchestras are to continue to exist, then we must give the patrons what they want: more dead white men. However, we see orchestras such as the Los Angeles Philharmonic thrive while presenting innovative seasons with incredible gender and racial diversity without abandoning the classics. We must free ourselves from slavery from the canon and return our operatic and concert houses to what they were in the times of Mozart, Beethoven, and Haydn: cultural centers for the music of the current times. The myth of genius is used to keep concert music dead, white, and male. By turning the concert hall into a museum for the Classical canon, the myth of the composer-genius keeps concert music dead, white, and male. It is no secret the canon is almost wholly comprised of the work of European males. The occasional woman is sometimes included: Hildegard von Bingen, Francesca Caccini, Fanny Mendelssohn, Clara Schumann, Alma Mahler, and Amy Beach. Composers of color are mostly ignored. It is pretty clear that not all of the prerequisites for being a “genius” are skilled-based. White males are afforded the honor much easier than anyone else. Black composers such as Duke Ellington or Thelonious Monk are sometimes afforded the label of genius, however their work was mostly in Jazz. The effect of this exclusion of women and people of color from the pantheon of genius is obvious. Their work is not performed, heard, and valued at the same level of white men. After all, if we have the work of geniuses, why bother with anyone else? As I write this, I’m listening to a recording that couples the piano concertos of Mr and Mrs Schumann. In track three, I marvel yet again at Robert’s genius. The leaping melody of the finale turns into a fugue and then a waltz, enticed by the piano into modulations that never lose their power to surprise and delight. Then comes track four, the first movement of Clara’s concerto, and within ten seconds we know it’s a dud. The first phrase is a platitude: nothing good can come of it and nothing does. Throughout, the virtuoso passagework is straight out of the catalogue. In her defence [sic], it’s an early piece; her mature Piano Trio is more accomplished, though its lyrical passages could have been cut and pasted from one of her husband’s works. It is a mystery why Mr. Thompson, whose degrees are in religion and sociology, felt that his opinion was of any consequence to this subject. However, it does not take a degree to realize how foolish his argument is. One person’s musical tastes should not dictate whether or not any composer’s music should be studied. I may believe that the symphonies of Beethoven are vastly superior than those of Haydn, but I wouldn’t dare to question if Haydn should be studied in school. Even when he feels that Clara’s work matches that of her husband’s in the Piano Trio, he feels that is only more cause to ignore her, since its style is close to Robert’s. Throughout music history there are composers whose style emulated that of another composer, yet no one advocates for ignoring early Beethoven symphonies and piano sonatas because they harken to the style of Haydn. But this is the problem with putting so much stock in the concept of genius. One listener’s genius is another listener’s derivative hack. And while most would scoff at Thompson’s outlandish beliefs, the repertoire lists of many of the ensembles, presenting organizations, recording labels, and music classrooms of the country would seem to demonstrate some silent agreement with the premise. These repertoire lists are filled with the music of Robert, Felix, and Gustav, but Clara, Fanny, and Alma are ignored. So too are great composers such as Joseph Bologne, Chevalier de Saint-George, Samuel Cooleridge-Taylor, William Grant Still, Florence Beatrice Price, Margaret Bonds, George Walker, and so many others (except perhaps for a token performance in the month of February). Perhaps then is time to put aside the myth of the composer-genius. This does not mean an abolition of the canon, but it may mean that perhaps we longer need to stack our performance seasons, albums, and music courses with the works of these dead white men. Perhaps Beethoven, Brahms, Tchaikovsky, and Mahler do not all need to be heard every season. Perhaps half or more of our programming could be dedicated to those forgotten by the canon or even better, living composers. Those works of the canon will not cease to exist if we do not play them year after year. ​We must reevaluate our relation to the canon, and shedding the weight of the composer-genius may be a first step in that reevaluation. At best, the Classical canon is a learning tool — a historical account of how concert music developed over the centuries. At worst, the canon can serve as a tool of patriarchal White supremacy, extoling the art of the Western “geniuses” over the musical heritage of native and minority cultures. The sooner we overcome our obsession with the canon, the sooner we can see the multitude of voices that could enrich the concert and recital halls. Now, more than ever, we must question if the concept of genius fits within the just society most of us hope to one day achieve. We must question if our morals are worth sacrificing for the sake of genius. Yes, Richard Wagner was a virulent anti-Semite (who borrowed heavily from the very Jewish composers he publicly insulted), but he was a genius! Yes, Carlo Gesualdo killed his wife and her lover in a jealous rage, and was found innocent due to his nobility, but he was a genius! Yes, Hector Berlioz stalked Harriet Smithson for years, and would later go on to be unfaithful to her in their marriage, but he was a genius who created his great Symphonie Fantastique for her! There is a reason why a very unstable and unintelligent president desperately wants to be seen as a “very stable genius.” Genius affords privileges not granted to common folk. Their work can live on despite their detestable views and actions, and it is up to us to “separate the art from the artist,” even when those detestable views are central to their art. Yet our worship of genius has more personal costs as well. So many of us that write and perform music struggle with anxiety, depression, and feelings of inadequacy. We think that we are imposters and frauds who could never live up to work of the geniuses before us. We work ourselves to the bone striving to make each work a masterpiece. Instead we should realize the truth: the composers of the past were humans just like us. They had to put food on the table, pay the rent, and support their families. Not everything they wrote was a masterpiece, some just paid the bills. Sometime in the Fall of 2014, Dr. Joel Hoffman, then head of the composition department at the College-Conservatory of Music at the University of Cincinnati, was preparing to give his last faculty recital before retirement from full-time teaching. This recital was made all the more special due to the fact that is son, violinist Benjamin Hoffman, would perform his piece Partenze, a work written in 1990, and dedicated to Benjamin when he was an infant. Before this recital, Dr. Hoffman led one of the weekly composition symposia at CCM, and invited his son to perform Partenze for the composition students as a preview to the recital. I was there, as a DMA student at CCM at the time, and watched as Benjamin expertly played this work, as the older Hoffman beamed with pride. Following the performance both father and son took questions from the composition students about the work. One of my classmates asked Benjamin to compare the process of preparing a work by his father to that of a long-dead composer. Benjamin noted that while it was beneficiary to be able to work in person with his father, his preparation was not all that different. His reasoning was that performers should treat the work of living composers with the same respect and commitment as they would one by Bach, Beethoven, Brahms and the like. Sadly, I did not have the foresight to record or write down Benjamin’s next statement, and I fear that recalling it years later will not do it its full justice, nevertheless it has stuck with me over the last five years, and was the impetus of this blog post. He argued that many probably feel that musical genius has gone out of the world. That the days of great works like those of Mozart, Beethoven, and others are over. Yet he contended that that was not the case. Composer-geniuses did still exist, and it was important to give their work just as much care as you would to those geniuses of the past. The implication here, of course, was that his father was one of those composer-geniuses. I actually have no qualms in Benjamin Hoffman’s assessment of his father as a genius. In the little time I got to know him before his retirement, it was clear to me that Dr. Joel Hoffman was not only a talented composer and musician, but an incredibly intelligent and thoughtful individual. In fact, from the first moment I met him in my piano proficiency assessment, I was so intimidated by his knowledge and intensity, that I decided I would not study with him — perhaps, out of fear that he would see through my charade of calling myself a composer, and see me for the fraud I really and truly was. By the time I came to realize he was also a kind and supportive teacher, it was too late for me to study with him. He had announced his retirement. I’m sure we can all admire Benjamin’s commitment to new music. A DMA candidate in violin at Yale, who studied from members of the Cincinnati Symphony as a child, Benjamin’s talent and dedication would make him a dream collaborator for many, especially those of us who have suffered through half-assed performances of our music by string players who would rather be working on Bach Partitas. Yet without knowing it, Benjamin was perpetuating a dangerous myth in not only art, but all of Western society: that great art and achievements can only be the product of genius. Such a myth is not only dangerous to those of us who write music — poisoning us with constant imposter syndrome and anxiety that our work will never be enough — but it has allowed musical culture to become ossified around the work of a select few composers – those worthy enough to be elevated to the status of genius. This ossification has turned concert and recital halls into museums, where music is not to be actively engaged with, but passively admired and respected by those cultured enough to appreciate it. Yet, what happens when society moves on from the museum? When people refuse to pay the high price of admission to listen to the music of long-dead white men? Who will be left to marvel at the works of these so-called geniuses? Today, I am not here to disprove that composers of the Classical canon were geniuses. I have not searched dusty archives and found long-lost IQ tests taken by the likes of Bach, Mozart, and Beethoven. Rather, I am here to argue that the persistence of this label is not only unnecessary to the appreciation of the music of these individuals, but that doing away with this label is a step toward saving this art of notated concert music, which we are constantly told is in danger of being lost. But first, what is “genius?” We hold the concept of genius in extremely high esteem, yet the term is so ubiquitous that it has become essentially meaningless. While bemoaning the contemporary trend of over-exaggeration in mundane daily interactions, disgraced comedian Louis C.K. mused in his album Hilarious, “…all these words we use. Anybody can be a genius now. It used to be you had to have a thought no one ever had before, or you had to invent a number.” Yet now, he complained, an act as simple as getting an extra cup while eating out can earn the praise of, "Dude, you're a genius!" In her article, “Modernist Composers and the Concept of Genius,” musicologist Anna Piotrowska points to Enlightenment philosophers such as Kant for codifying genius in art. In his “Philosophy of Art,” within the larger Critique of Judgment, Kant himself writes, “Genius is the talent (natural endowment) which gives the rule to art. Since talent, as an innate productive faculty of the artist, belongs itself to nature, we may put it this way: Genius is the innate mental aptitude (ingenium) through which nature gives the rule to art.” It is interesting, and perhaps a little ironic, that the Age of Enlightenment — an era when philosophers strived for a greater emphasis on knowledge and reason, and when egalitarian ideals of equality helped to topple empires built upon unearned nobility — that such an era, would produce a concept that held an individual up as exceptional, not through study and practice, but because of some unearned innate ability. In his book, The Possessor and the Possessed: Handel, Mozart, Beethoven, and the Idea of Musical Genius, musicologist Peter Kivy points even further back to Plato and Longinus, who imagined the genius to be in a state of possession by the muses who would use them as a conduit of creation. “Natural endowment,” possessed by muses — in these definitions we see genius as something that is gifted, not developed. Thinkers such as Cesare Lombroso would go even further, to connect genius to mental illness. This romanticism of mental illness is especially seen in discussions of Robert Schumann, who spent his dying days in a mental asylum. Genius was not only a possession, but it was a possession that the normal human mind could not always handle. It is not his training, years of focused work, or the propagation of his music by powerful patrons, publishers, and tastemakers that make the genius’s art great, it is the fact that he is chosen, gifted either by the divine or by nature to create the masterworks that we enjoy. And yes, I am purposefully using masculine pronouns to refer to the composer-genius, for reasons that will be made clear later (if they are not already painfully clear). Both Piotrowska and Kivy point to the 18th and 19th Centuries has the height of the adoration of composer-geniuses. Names such as Handel, Haydn, Mozart, and Beethoven appear as the usual suspects. These composers are known for their massive catalogues of works. The work of these men is so expansive and celebrated, that there is no surprise that the label of “genius” so easily applied. Handel wrote his most-beloved work, Messiah, in the span of twenty-four days (though he made numerous edits and revisions for years to come). Haydn was not only instrumental in defining the symphony as we know it, he wrote one hundred and four of them. Mozart was a well-known child-prodigy, who is said to have written the overture to Don Giovanni the day before (or perhaps even the day of) its premiere. Beethoven is not only credited with starting a new period of music, but composed some of his most celebrated music despite profound deafness. I wouldn’t dare to question the magnitude of these achievements, but the question at hand is: should we chalk these accomplishments up to genius which only few can achieve? Or, were they feats of skill which can be achieved by anyone who devotes their life to the craft? In musicological tradition, Beethoven is credited with the radical change in the status of composers. Even more than Mozart, Beethoven symbolised [sic] an emancipated composer independent of the court hierarchy; he denied the concept of a composer servant working for his master, often asked to undertake several jobs, sometimes unconnected with musicianship, or expected to perform on an instrument, conduct an orchestra, teach and finally compose. It was Beethoven who, in accordance with the tendency, dedicated himself mainly to instrumental music, which overtook the dominant role of vocal music; he composed instrumental music that gained almost sacral status in the eyes of early Romantic poets and intellectuals. Beethoven's patrons — mainly aristocratic ones — were not without ulterior motives: they managed to sustain their role as cultural leaders, who not only possessed good taste, but, while acting as real connoisseurs, could also still define the boundaries of what good, great music was and thus dictate what should be considered as fashionable and desirable — and what not. As a result of their attitude the image of the 'great composer' was being constructed at the same time. The process of creating the ideology of the 'great composer' began. The myth of a genius-artist was not born, as some authors pathetically write — it was socially constructed in order to support not the artists themselves, but their patrons. This post is Part I in a two-part series. Points 1. and 2. will be covered in this post while points 3-5 will be covered in Part II. In study after study, of composers, basketball players, fiction writers, ice skaters, concert pianists, chess players, master criminals, and what have you, this number comes up again and again. 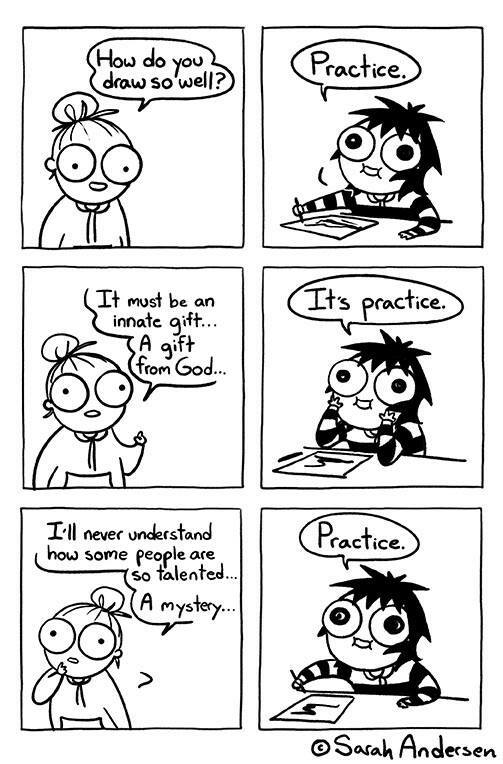 Of course, this doesn’t address why some people get more out of their practice sessions than others do. But no one has yet found a case in which true world-class expertise was accomplished in less time. It seems that it takes the brain this long to assimilate all that it needs to know to achieve true mastery. …by the standards of mature composers, Mozart’s early works are not outstanding. The earliest pieces were all probably written down by his father, and perhaps improved in the process. Many of Wolfgang’s childhood compositions, such as the first seven of his concertos for piano and orchestra, are largely arrangements of works by other composers. Of those concertos that only contain music original to Mozart, the earliest that is now regarded as a masterwork (No. 9, K. 271) was not composed until he was twenty-one: by that time Mozart had already been composing concertos for ten years. It must be noted that Ericsson would go on to challenge Gladwell’s use of the 10,000-hour rule, and that deciding which of Mozart’s pieces was his fist “masterwork” is a highly subjective endeavor. That said, it is not a controversial idea that it takes years of practice to master a skill. No one wakes up being able to compose concerti and symphonies. I would also argue that few would consider Mozart’s childhood and early adult works to be superior to his later works. As for Mozart’s skill as a child, well it helps when your father is Leopold Mozart, the pedagogue who literally wrote the book on violin performance: A Treatise on the Fundamental Principles of Violin Playing. Leopold would give keyboard lessons to his daughter, Marianne, and would later find a young Wolfgang imitating his big sister. Leopold transcribed, and no doubt edited the improvisations of the young Wolfgang that would become his first compositions. Mozart was no mere conduit, receiving his music from the beyond, he was a successful student of his father’s pedagogical methods. Returning to Beethoven, it is common to see his deafness often put forward as proof of his genius. Who, but a genius could still write such incredible music despite total hearing loss? And while it is an incredible feat to be admired, the answer is actually quite simple: aural skills. Beethoven’s hearing loss was gradual, not sudden. Beethoven was a great composer, pianist, and improvisor before his deafness. He studied harmony, counterpoint, and form. He knew how music was to be constructed and successfully translated the music from his head to manuscript paper. He refused to let his handicap prevent him from pursuing his passion and livelihood. Beethoven’s story is not one of divine forces giving him the gift of music. It is one of a man overcoming disability through skill. The act of composing is often treated as a mystery by both musicians and non-musicians. Many of us have had non-composers ask us about the process of writing, and remark how they could “never do that.” And while creativity can often be elusive, it can also be learned and honed. If that were not the case, there would be no reason to study composition, and the hundreds of composition departments in colleges and universities across the world would be wastes of money and space. As an undergraduate composition student at Lawrence University in 2010, I was extremely excited that one of my compositional idols, the late David Maslanka would be in residency at the Conservatory. A year prior, I was considering quitting composition, and perhaps music altogether. However, it was performing A Child’s Garden of Dreams that inspired me not to give up. His influence on my output at that time is plainly evident, and I was honored to have been selected to have a lesson with him. Prior to my lesson, I was present at every rehearsal he sat in, and presentation he gave. With each presentation and interaction, I started to see his deep spiritual nature. In one presentation, instead of talking about his music, he led a group mediation. In another presentation, he stated that an important part of his artistry was allowing the music to speak through him. As someone who was in the process of discovering their own atheism, this was very disappointing to me. I wasn’t sure what I could learn from someone who received their inspiration from on high. Of course, I was relieved to find out in my lesson with him, that he had very concrete suggestions to give me concerning my music. He even gave me advice on getting more polished performances from my players upon hearing the lackluster recording of my piece. While I don’t begrudge anyone their spiritual or religious beliefs, I truly believe that we must be open an honest about how we create and what inspires us. Our music is influenced by the work of those who have come before us. It is influenced by our environment and experiences. It is influenced by our training. If we insist on the act of creation as a mystical gift from the muses, we are diluting our own agency in that act of creation. If musical inspiration comes from above, why should we bother studying? Why should we bother with lessons? Why should we bother engaging with new ideas? Composition requires skill and skill is learned, not given. If we choose to see the work of the great composers of the past as products of genius, or see these men as mere conduits for the divine art, then we are choosing to ignore their years of hard work, their years of struggle, and all of the teachers, mentors, friends, and loved ones who helped them achieve their greatness. If skill is given and not learned, that means that composition cannot be taught, that means that composers are chosen. We often think of talent as innate. We see athletes, musicians, and thinkers who are able to accomplish amazing things, and assume that they are naturally disposed to that thing. But where does this innate talent come from? Who or what decides how talent is distributed? How are they chosen? One can only help but marvel at the logical dissonance between a capitalist society that values hard work, productivity, and merit-based achievement, and the idea that some members of that society are gifted with incredible talent that no one else could achieve. Granted, for some talents, like athletic ability, natural factors such as height and bone structure help the athlete to excel at their sport. But what mental attributes make one pre-disposed to be a composer? Yes, we need to be comfortable spending long periods alone in solitude and concentrated work. We need to be able to create quickly and work on deadlines, but not only are we not born with these attributes, they can be learned. If we believe that only certain individuals are given the “gift” of compositional skill, we send a dangerous message of exclusivity and privilege. Of course, this is the very message that was sent to a number of hopeful composers of the past, and helped maintain a homogenous club of male composers of European descent. Part II discusses the role of the composer-genius myth in alienating the casual listener, preserving the Western cultural canon, and excluding non-male and non-white composers from that canon. Read on here.